1.Prepare outdoor grill for direct grilling over medium-high heat. In small bowl, whisk oil, vinegar and hamburger seasoning until combined. 2.Wipe tops of mushrooms with damp paper towel. Place mushrooms in large zip-tight plastic bag; pour oil mixture into bag. Seal bag, pressing out excess air. Massage mushrooms in bag to coat with marinade; let stand at room temperature 15 minutes. 3.Remove mushrooms from marinade. Place mushrooms gill side up on hot grill rack; cook, uncovered, 13 minutes. Turn mushrooms; cook 5 minutes. Top each mushroom with 1 slice; cover and cook 2 minutes longer or until cheese melts. 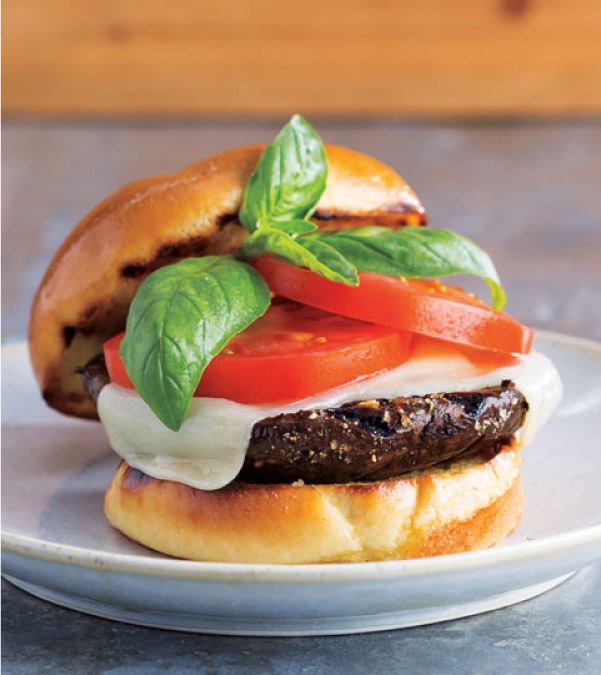 4.Place mushrooms on bottom buns; evenly top with tomato slices, basil sprigs and top buns. > Mushrooms are very porous and absorb moisture easily. Do not wash or soak them in water or they will become soggy. > To easily remove the stem from a mushroom, gently rock the stem back and forth until it releases. > If time allows, let the mushrooms stand 30 minutes or refrigerate up to 2 hours in the marinade. > To toast the buns, place them cut side down on the hot grill grate during the last 2 minutes of cooking. > Try sundried tomatoes, olive tapenade or roasted garlic on your burgers. > To cook the mushrooms in the oven, place them gill side up in a baking dish and bake at 400° for 10 minutes. Turn the mushrooms, top with cheese, and broil 1 minute or just until the cheese melts.